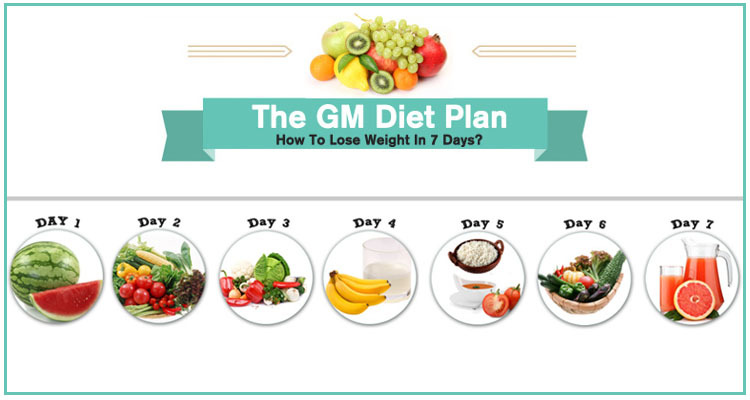 GM Diet Plan for Weight Loss in 7 Days | Diet Happier! The General Motors diet, or GM diet, has definitely been one of the most effective yet lesser know diets that I have ever tried and have had success with. Though the GM diet plan isn’t as well known as some of the more popular diets today, it is definitely worth giving a shot if you’re looking for an effective diet that produces results. Though there are many great things I could list about the GM diet (which I will do in just a moment), a few outstanding things come to mind that you must know: the diet is incredibly effective, it’s super easy to follow, and it’s extremely cheap! But before we can dive into all the great things that the General Motors diet has to offer, we must first understand what the diet is and how it actually works in order to get the best results. Believe it or not, the GM diet was actually created by General Motors in the 80′s, or so the story goes, with the use of a special issued grant. Though their diet was designed specifically for their employees and was intended for exclusive use by their employees only, it has become a somewhat “little known phenomena” in the diet and fitness world. The GM diet plan was designed as a 7 day diet that targets fat, enabling you to reduce up to 17 lbs. in one week. In order to do this, the GM diet follows 7 days of strict dieting that consists only of certain foods and certain food groups. Drink a minimum of at least 10 glasses of water a day and 15 at the most. Day 1 – On day one you should eat fruits and only fruits. This means you can eat as many fruits as you would like but you must stay away from bananas. It is often advised that you try and consume more melon than anything on this day. Day 2 – Day 2 is vegetables and only vegetables. Try starting your day off with a medium sized potato and then eating various vegetables throughout the day, try balancing meals of both mixed and raw veggies. It is crucial that you stay away from all dressings! Day 3 – This day you should eat meals consisting of only fruits and veggies. Though it is fine to consume as much as you would like, you should again avoid bananas. Day 4 – If you miss bananas, todays your day! On day 4 your meals will consist only of milk and bananas. Throughout the day, you need to drink at lease 3 cups of milk and consume as many as 8 bananas. Day 5 -Feeling hungry? Not to worry, you get to spoil yourself on day 5! Day 5 consists of only beef and tomatoes. Throughout the day you should eat two 10 oz. servings of lean beef mixed with 6 whole tomatoes, preferably one serving for lunch and the other for dinner. This day you will also be focusing on cleansing your body by increasing your water intake to 1 quart. Day 6 – Day 6 is another feast day! Your meals will consist of beef and vegetables, as much of it as you would like! Day 7 – Your almost done! On day 7 your meals will consist of brown rice, veggies, and fruit juice. The GM diet soup was added as an intended supplement to the diet. It’s meant to help curb your appetite while maintaining a low caloric intake throughout your 7 day diet. Ingredients: 28 oz Water, 2 Green Peppers, 6 Large Onions, Whole Tomatoes, 1 Bunch Celery, 1 Head Cabbage, 4 Envelopes Lipton Onion Soup Mix and any additional herbs. Much like any other diet, one of the most important ways to find success with it is preparation. Staying hydrated – As you can see by looking over the GM diet plan, you are required to drink tons of water. This is incredibly important because the General Motors diet is actually designed to boost your metabolism. This increase in metabolism usually leads to excess sweating. Self control – Much like any other diet, self control is crucial. Again, as you might notice after looking over the General Motors diet plan is that it is fairly strict. You will often find yourself feeling hungry, as it may be a big change in your diet. In order to prepare yourself for this, you should take a week or so and try adjusting your diet so that you are consuming less. If you’re going to set off onto any diet, you probably have one thing in mind…results! The great thing about the GM diet is that achieving results is quite common, most dieters are expected to lose anywhere between 10-17 lbs. but if you’re the type of person that actually finds it difficult to achieve the results that you’re looking for when it comes to a diet, there are a couple of ways to ensure that you are successful with the GM diet, those things are exercise and supplementation. Exercise is crucial for weight loss whether you’re dieting or not. In order to improve your weight loss results while using the GM diet, you should focus on cardio intensive exercises; running, jump roping and biking are great. If you plan on adding an exercise routine to aid your diet, you should definitely focus on your water intake. Another thing you should consider while doing the GM diet is supplementation. Though there are often a few negative “stigmas” surrounding weight loss and fat burning supplements, there are actually a few out there that actually work. One supplement you should definitely consider is OxyELITE Pro, which is a thermogenic that works by increasing your metabolism. I’ve actually used this supplement many times and have found it to work incredibly well when compared to other fat burners.